Before beloved Venice Beach literary arts center Beyond Baroque was a place, it was a publication. Fifty years ago, a high school teacher named George Drury Smith founded the eponymous poetry magazine and served as its editor. A year later, in 1969, Drury Smith created a physical space to live out the creativity he’d pressed into the magazine’s pages when he began holding after-hours poetry readings in his small printing shop. This year, Beyond Baroque is celebrating its 50th anniversary, a major milestone in the local poetry scene. While it may be the oldest, most established, and only place devoted entirely to literature and arts in the city, other spots in L.A. aren’t skimping on the poetry front. Whether you’ve been wed to verse your whole life or if you’re just barely getting to know it, L.A. has all kinds of venues, organizations, and events for every rhyme and reason. This bohemian-style coffee shop in Santa Monica screams literary lavish. UnUrban’s monthly poetry open mic, presented by the Velvet Guerilla Cabaret, offers the chance to plop down for a steaming drink, a sugary pastry, and a peek into the notebooks of the creative poets who volunteer to read their work. Catch it the second Thursday of each month at 8 p.m.
3301 Pico Blvd., Santa Monica. For the past 20 years, the Redondo Poets have been congregating every week to celebrate and share poetry. They host their weekly poetry readings at the Coffee Cartel in Redondo Beach, a cozy venue with brick walls lined with bookshelves. Catch them there every Tuesday evening for their open mic, where a featured poet usually makes an appearance. 1820 S. Catalina Ave., #2, Redondo Beach. Calling itself a “positive performance lab,” Downbeat 720 offers a stage exclusively for high school artists to perform in front of an audience their own age. Promoting a supportive and structured yet relaxed environment, Downbeat 720 welcomes all types of talented teens: musicians, comedians, dancers, and—you guessed it—poets. Get there early to sign up and share or just show up and listen. The event takes place every second and fourth Tuesday of the month at the Miles Playhouse in Santa Monica. 1130 Lincoln Blvd., Santa Monica. An arts-education nonprofit revolving around the startling statistic that 25 percent of American children grow up illiterate, Get Lit strives to make a difference, with poetry as its weapon of choice. Their bi-monthly open mics encourage local youth to get on stage and are typically opened by the Get Lit Players, an award-winning youth poet ensemble (and the most watched group of poets on the web!). Get Lit also offers drop-in classes, summer camps, and an annual poetry slam. 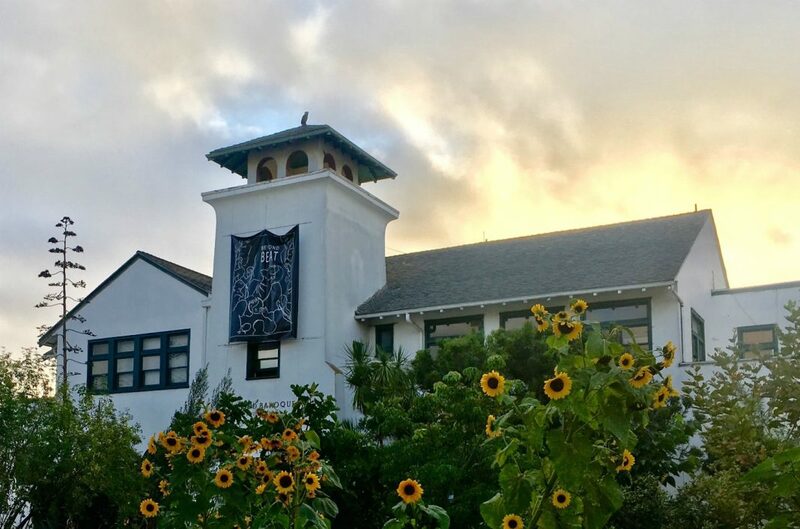 If hunkering down for 48 hours for some serious poetry practice sounds enticing, then the third annual Southern California Poetry Festival is the event for you. The festival, which takes place over a weekend in mid-November, is devoted to the diversity of voices across the region. This year it will be held at none other than Beyond Baroque as part of the center’s anniversary celebration. The festival will run from November 16 through 18 and will offer workshops led by distinguished local poets, poetry film screenings, readings, and special guest appearances. A circus-themed bookstore planted in Highland Park, Book Show embraces all things strange, quirky, and unusual…an attitude that is reflected in the eccentric setup of the shop. Book Show’s monthly Friday night poetry night, It’s Just Words, welcomes the fun and the freaky to an open mic, and showcases a performance by a featured poet. The next It’s Just Words takes place on Friday, October 26. 5503 N. Figueroa St., Highland Park. Located in Los Feliz, this indie bookstore’s walls are lined with everything from zines to graphic novels, among which you can settle in for the events frequently held on site. While there isn’t a chance to recite your own poetry, there is plenty of opportunity to listen. Skylight Books presents authors, podcast hosts, celebrities, and of course, poets. Keep an eye on their events calendar for bigger names in the lit scene and swing by to hear these published poets read excerpts of their work. 1818 N. Vermont Ave., Los Feliz. While some turn to poetry for its lyricism or its accessible short-form, the Street Poets turn to it for its healing power. What started as a poetry workshop at a juvenile probation camp, Street Poets has expanded into an arts education organization that runs projects across the world, all stemming from the idea that poetry can be utilized to help us tap into the darkest parts of ourselves and release that tension in a proactive way. Their poetry and meditation workshop is held every Tuesday from 4 to 6 p.m. at Community in downtown Los Angeles. If poetry were a religion, the people of Da Poetry Lounge might be its most fiery followers. Every third Tuesday of each month DPL hosts its famous poetry slam and the energy is tangible. Even if you’re not up for competing yourself, this monthly slam is a spectacle that’s not to be missed. Get there early as the line tends to wind down the block. Can’t make it on the third Tuesday of the month? Stop by any other Tuesday at 8 p.m. for DPL’s just-as-spirited open mic—the largest weekly open mic in the country.